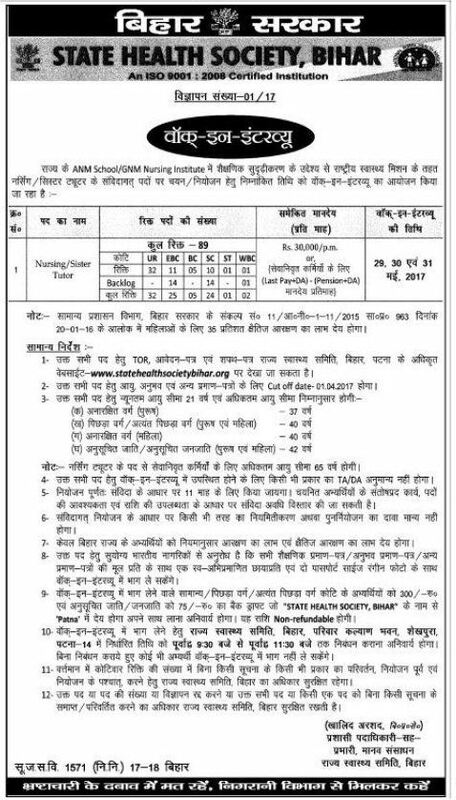 for this State Health Society of Bihar Nursing/Sister Tutor Jobs Recruitment will be held from 29-05-2017 to 31-05-2017. Selection will be held based on performance in walk in interview and previous work experience for this SHS Nursing/Sister Tutor Jobs. 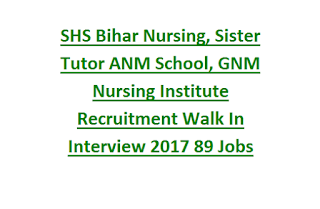 For more details regarding this State Health Society of Bihar Nursing/Sister Tutor recruitment 2017 please see below given information. 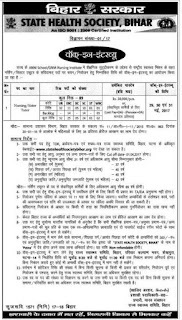 As on 01-04-2017 age limits for Nursing/Sister Tutor posts in BIHAR State Health Society Recruitment is 21 to 37 years for male General Male Candidates. Candidates must have qualified B.Sc/M.Sc Nursing and having prior experience in Teaching. The selection for BIHAR Sister Tutor will be held based on merit in academic qualifications, higher qualifications and experience. All the candidates have to attend the Walk in interview. There is no written test. At the time of walk in interview General, BC and OBC candidates have to submit the Rs.300/- Bank Demand Draft in the favor of "State Health Society, Bihar" payable at Patna and SC/ST candidates have to submit the Rs.75/- bank DD to the same address. Time: 09:30 AM to 11:30 AM. Interested and eligible candidates may have to carry the Original Certificates along with attested copies of educational qualifications, Registration Certificate, experiance certificate, age proof certificate, caste certificate and nationality certificate, also application form and other required documents. For complete details please visit the official website of State Health Society of Bihar @ www.statehealthsocietybihar.org. 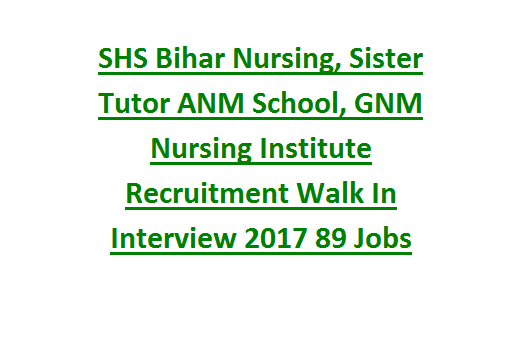 Click here to see the official notification of Bihar State Health Society Jobs of Nursing/Sister Tutor Recruitment 2017. Please share this recruitment notification of Bihar State Health Society Nursing/Sister Tutor Posts to your beloved friends through social media and help them to achieve the better job.